The Model LPA is an ergonomic vertical lifting clamp capable of turning a single plate or member from horizontal to vertical, back to horizontal through a 180º arc. It incorporates an auxiliary push button lock. Permits side loading of lifting shackle to 90º by de-rating of clamp’s capacity(refer to PDF attachment for details). The “Lock Open – Lock Closed” feature facilitates attaching and removing the clamp from the plate. 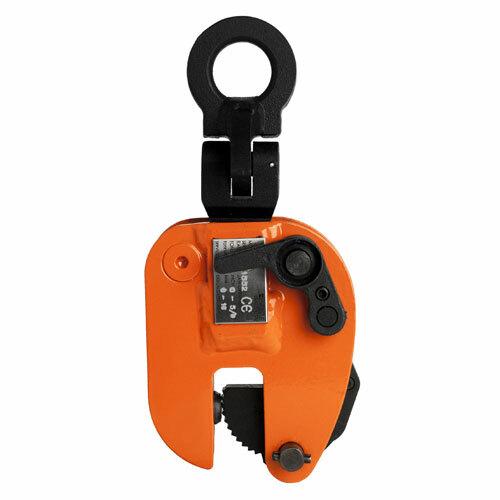 The Model LPA incorporates a pivoting shackle that permits side loading of the lifting shackle at 100% of rated capacity from vertical to 30º, 75% of rated capacity between 30º and 45º, and 50% of rated capacity between 45º and 90º.